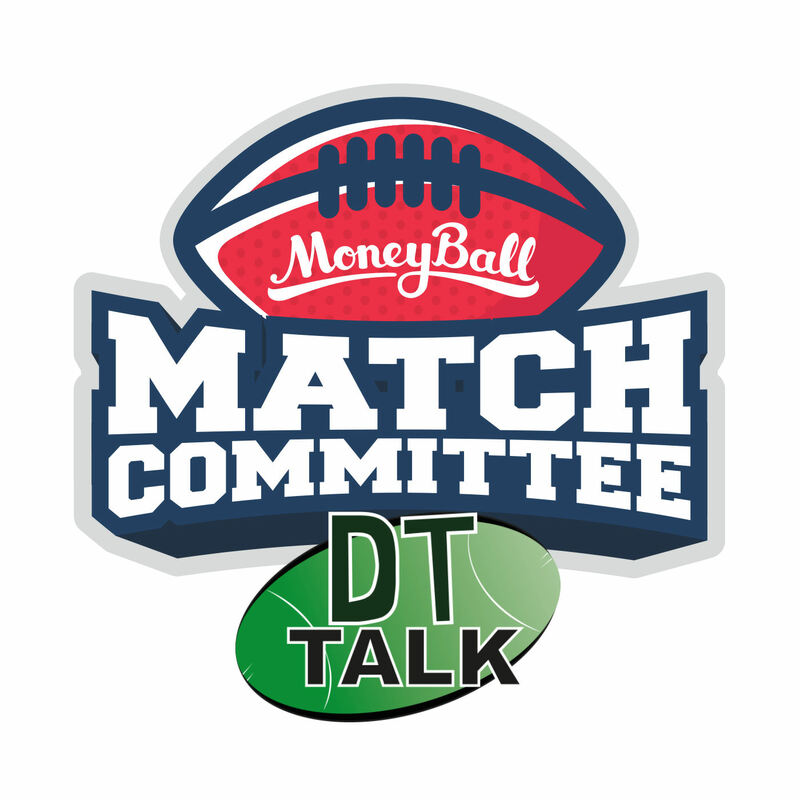 For the maximum edge over your DFS competition, make sure you’re soaking up the good oil in the Match Committee Podcast while building your Moneyball line-ups for Round 21. Good luck! Lewis Pierce ($4,300 RU) is the nominal ruckman here, playing his first game in a couple of seasons which probably indicates his talent level. In saying that, he’s averaging 110 MB from 41 hitouts in his past 5 VFL games, so he’s got the form to justify his selection. At a slither over basement price, and with the first bite at the ruck apple, Pierce looms as a must-pick. Rowan Marshall ($5,100 FWD) has only played once with both Hickey/Longer missing, scoring a healthy 82 in just his second career game. He won’t have solo ruck duties here, but his brief history suggests he doesn’t need a lot of hitouts to be a successful DFS pick – his best hauls were 18, 23 and 14 hitouts, resulting in scores of 82, 114 and 88 respectively. After a slow start to the season, Zach is now on an 11-game rampage of 98+ scores to rank as the most consistent DFS pick in the game. He’s ridiculously far ahead in that area too, with Coniglio and Dunkley next best with modest 6-game streaks, while the next best 11-game basement is Zorko with 89. It’s an obscure stat, but it’s basically in here to say the obvious – Merrett will be great tonight, and if not, he’ll be serviceable at worst. Zach boasts hefty scores of 126 and 144 in his last two against St Kilda, and it will require a vastly improved tag from Jack Steele to prevent him from adding another worthy score to that list. Gresham’s last few scores reads 104, 101 and 98, which are highly impressive totals for a guy playing exclusively out of a forward pocket. Notably, he’s collected 24, 25 and 26 touches in those games – 3 of his 4 best disposal tallies over his career. As it so often happens with fringe players, we finally see enough exposed form to pick them and they bomb the instant you slide them into a DFS line-up – that’s certainly a possibility here. Intriguing numbers nonetheless. The veteran trotted out in a foreign half-back role for the Saints last week, scoring just 66 from 19 touches. Armitage really needs to be in the guts to be pickable – he averaged a spicy 97 in his previous 5 games in the midfield, after all. Savage’s injury probably caused this role change, and there’s no guarantee it’s here to stay – but it demonstrates his current shaky standing in a rebuilding team. For what it’s worth, Armitage has been named in a forward pocket this week after being named in a back pocket in Round 20. Ceglar has been doing an excellent job sitting in for McEvoy over the past month, pumping out 97, 80 and 80 in his past few. In fact, he averages 80 MB without Big Boy this season, compared to just 48 alongside him. Obviously, the Hawks ran a different ruck set-up back in Round 2, but McEvoy’s season-high 116 with 43 hitouts against the Cats last time is a great omen for Ceglar. Gaz is the owner of the greatest ever bunny-record against a single team, ticking over at a lazy 144 in his last 10 games against the Hawks – with a lowest of 129 in that stretch. You’ve probably heard those stats rolled out during the week but probably not this one – Ablett has polled an incredible 11 of a possible 12 Brownlow votes against Hawks their last four clashes. Or, another gem: you have to go back to 2007 to find a game where Gaz didn’t have at least 32 touches against Hawthorn, a 15-game streak. If you leave him out this week, you’re strictly fading to go against the grain. It feels like we’ve paying overs at $7.4k because we used to get him at basement price, but his recent numbers suggest that he’s actually heavily underpriced 20 rounds into the season. Kelly has produced 98 or more in 5 of his past 6 games, and boasts a hefty 115 against the Hawks earlier in the year. That was accomplished in just his 2nd career-game – what can he do with another 17 appearances under his belt? It’s clutching at straws here, but Geelong is his least favourite team to play over his career, managing a highest score of just 82 with a 76-point average against them. Obviously, that wasn’t helped by a season penultimate-low 67 against the Hawks back in Round 2. Is it enough to counteract his scintillating form however, averaging 110 in his last 7 outings? We’ve had some good signs recently from Dusty, who pumped out 114 last week in a goalless game – easily his highest score this year where he hasn’t kicked multiple goals to boost his total. Combine that with his record against the Suns – scores of 120, 100, 140, 137 and 112 in his last five against them, underlined by collecting 9 of a possible 9 Brownlow Votes in his past few – and we have a bargain on our hands. Incredibly, Lambert is Richmond’s highest-averaging player over their past 8 games. Opposition MID’s score, on average, 24 points more than their individual output against the Gold Coast this year, which puts Lambert well and truly into triple-digit territory here. Kane’s scores with 29 or more touches this year are 122, 104 and 120, so expect another belter with the touches Gold Coast give up each week. Are we giving Jarrod Witts ($8,900 RU) enough respect for his work lately? He’s the 2nd-highest averaging ruckman over the past 5 weeks (Grundy 118, Witts 108, then Gawn 107), yet he’s never spoken about in fantasy circles. That’s crazy, considering how badly he’s monstering opponents in the air, notching hitout totals of 56, 60 and 40 in his last few. With just a lowly back-up to deal with in the absence of Toby Nankervis (rest), he’ll have the red carpet rolled out for yet another triple-digit total. Speaking of back-ups, strongly consider throwing Ivan Soldo ($4,400 RU) into your FLEX slot. Soldo has only ran out as the solo ruckman once in his career, and he punched out career-highs with 75 MB from an impressive 43 hitouts. He can score, and he’s dirt cheap. Since Round 2, Short averages 87 when Houli is missing compared to 71 alongside him, and guess who’s back this week? Jayden is coming off just 44 last week, where he had just 14 touches – his lowest disposal tally for the year. I’d leave him at that price with those factors working against him. Averaging 123 over the past 5 weeks (including 3 scores over 130) and having busted out 138 on the Power back in Round 7, how can you leave him out? Redden will have all the midfield minutes he wants with Gaff suspended, which is all he’s never needed to succeed – and possibly soaks up a few of his +6 link-ups too. That’d be huge for Jack, as he’s scored 143, 135, 110 and 133 this year when reaching at least 8 marks. It’s simple. Lycett’s supercharged scoring with Naitanui on the sidelines makes him huge value, bumping up his output to 90 points a game, compared to just 69 as a sidekick. Port Adelaide have been the #1 easiest team to score RUC points on in the past 5 weeks, and Lycett’s busted out scores of 94 and 103 in the past fortnight. It’s all systems go. Gaff’s 31 touches and 5.5 marks needs replacing, and Sheed can help there after some rampant form at WAFL level, producing scores of 124, 126, and 133 in his last three. We know Sheed can score at AFL level – he averaged 92 over a 14-game stretch just last year – but he really needs that midfield time as opposed to trying to diversify off a half-forward flank. With Gaff out, he should get that valuable time and his disposal tally will certainly rise – his last 5 scores with 20+ touches reads 119, 81, 80, 81 and 89. He can go better. As we do each week, we want to dodge the Hutchings tag, and I don’t have a confident read on where it’s headed. I think we can rule out Gray even though that’s where Hutchings headed last time – but that was way back in Round 7 when Robbie was playing exclusively in the guts. Wines is the inside bull but Polec has been identified lately as a catalyst for Port’s ball movement, so it will be interesting to see what Adam Simpson deems the bigger threat. Hutchings is the 2nd-best tagger in the competition statistically, with his targets averaging 18 points less when hunted by him. Damningly, none of Hutchings’ last 5 tag victims have reached the ton, so make sure you avoid his prey. Zorko’s on my radar this week after dominating the Pies with scores of 130, 104, 122, 124 and 176 in recent times. Collingwood give up the huge “Captain-worthy” scores, with the best midfielder each week versus the Pies averaging 124 – the 2nd-most in the league after the hopeless Gold Coast. A big reason for this is that they don’t tag, so make sure you’re sending a bunch of cash Zorko’s way this weekend. If this latest tackling frenzy is to continue, you basically have to pick Adams as his scores with more than 7 tackles this year are 124, 135 and 134. With Jeremy Howe out again, you have to take a serious look at Crisp as a unique pick. While Jack averages a solid 85 MB alongside Howe this year, his scores without him are 115 and last week’s 105. Stef went almost 50-50 with McInerney in the ruck last week, which is hurting his numbers – much like it did with Archie Smith last year. He’s managed just 24 hitouts in both the last two weeks, way down on his regular 35 per game. Collingwood are the 3rd-hardest team to score RUC points against over the past 5 weeks, and with Brisbane hellbent on seeing with Big O can produce in the middle, you’d be silly to pivot to Martin this weekend. Simpson out means Lobb gets a look in the ruck, especially with Lachie Keeffe left out as an emergency. Removing injured games, Lobb’s averages of 6 hitouts and 60 MB as a forward skyrocket to 31 hitouts and 74 MB as a ruckman this season. Of course, we can’t forget the scores of 90 and 83 he had as the solo ruck in the finals for GWS last year, and that’s what we’re shooting for again here. Laird was tagged by DBJ last week and showed he can bleed, managing just 67 AF and a season-low 18 disposals. Unfortunately, that score is on trend for Rory, as he’s now averaging just 76 over the past 3 weeks. To put that into perspective, it’s his worst three-round average since Round 5 of 2015, and I’m not parting with $9k for that kind of output. Hopper’s been operating under the radar lately, pumping out 100, 93, and 122 as the Giants surge towards finals. With Deledio and Greene both missing, Hopper should earn his full allotment of midfield minutes again this week, at a generous price-tag. Macrae is averaging 113 since coming back from injury, with 3 of his 4 scores in that time over 112. It’s business as usual for the ball-magnet from a fitness sense, and he’ll enjoy coming up against the Roos this week, a club he’s pumped out 116, 114, 102 and 137 against in his last four starts. No Ben Jacobs again seals it – he’s your primary target this Sunday. The goliath will make a meal out of the Trengove/Roughead combo this weekend, especially as the Bulldogs concede the most hitouts of any team this year at a brisk 49 per game. Goldstein was excellent back in Round 14 against the Pups, dominating with 118 MB from 42 hitouts. Dunkley’s the highest-averaging FWD over the past 6 weeks, and even ranks as the highest-averaging Bulldog over the past 8 weeks. A big reason for that is his new midfield role and the proximity to the contest, ranking 2nd for tackles over the past 6 weeks at a healthy 7.7 per game. It’s amazing what happens when you give a young gun midfield time… And we can pick him as a FWD in Moneyball! Once again, we look to Sydney’s ruck counterpart after they’ve conceded easily the most points to rucks over the past 5 weeks, at an insane 113 per game! Grundy (150), Witts (132), Goldstein (125), and Nankervis (131) have all capitalised within the past 6 weeks, and now it’s Gawn’s turn, fitness permitting – he spent time off the track during the week but was branded a “certain starter” by Goodwin when quizzed. The Demons average the 2nd-most disposals in the league, yet Jones can’t ton up as a permanent midfielder? Jones has now gone 10-straight games without a ton, but averaging a solid 82 in that time. Bizarre. He’s cheap, but you have to leave the veteran out now that he’s lost his ceiling. 4 of Clayton’s past 5 scores have been over 121, and the only one that didn’t make the grade was when he was tagged. I thought that he’d be targeted by the Suns last week but that didn’t eventuate, and look what happens – he smashes out a career-high 154 MB. the Hewett tag toughest in the comp – his targets average 23 points less when hunted by him – and I don’t see any scenario where Oliver is allowed to run free this week. His scores when tagged this year are 88, 93, 82 and 89, and you can’t risk that kind of lukewarm output at his hefty price. The Brownlow contender has produced a lowest score of 116 in the past month, helped through ticking over at 9 tackles per game over past 3 weeks. Fremantle has conceded the 4th-most points to MID’s over past 5 weeks, making for an obvious DVP selection. If you’re worried about the Banfield tag, then don’t – he already broke it in Round 13 to finish with 38 touches and 109 AF. Besides, the Banfield tag isn’t as good as it used to be, with his opponents averaging 120 across his last 4 assignments. Fremantle concede the most points to small/medium DEF’s this year, with Simmo already cashing in on that with 111 MB on them back in Round 13. In fact, Kade loves playing the Dockers in general, averaging 105 in his last 7 against them. With his ordinary form over the past month at full price, Simpson will be unique enough to be worth the risk as a high-upside POD this Sunday. Want to win a trip to the AFL Grand Final? Of course you do!